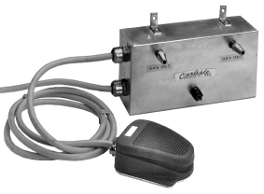 The EL Gas Savers Series uses solenoid valves in conjunction with a foot pedal to control the flow of gases. When the foot pedal is actuated the solenoid valves go to the on position. The on position will vary depending on the model in question. When the foot pedal is actuated a second time the solenoid valves go to the off position. The EL Gas Saver Series can be used with natural gas, propane, methane, butane, mixed gases, hydrogen, air, or oxygen. The EL Gas Savers are available with one, two, three, or four solenoid valves. By specifying the delay option, the system then will be fitted with a timer that will delay the closing of the gas solenoid valve. This will allow the other valves to shut off before the delayed valve. The air purge option allows one of the solenoid valves to control an air line that will be used only for purging the system. When the Gas Saver is shut off, it will close the other valves and then open the air valve for a predetermined time between one and ten seconds. The EL Gas Saver Series is not to be used with a premix burner without either the delay or purge options. These options allow the Gas Saver to run safely with a premix burner. The EL Gas Savers are also available in the standard 1/4" valve or the Hi-Capacity 1/2" valve. The connections available are hose adapters, welding hose adapters, or JIC adapters.